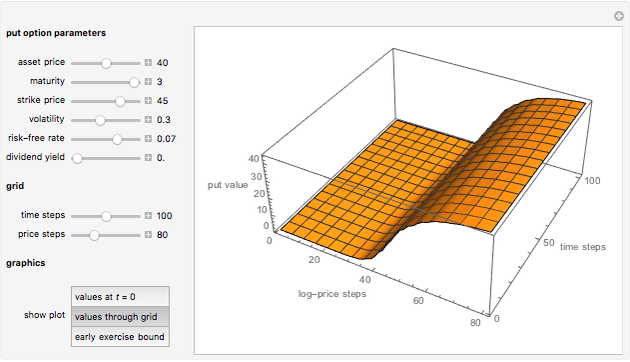 This Demonstration shows the application of the Crank–Nicolson (CN) method in options pricing. The CN method  is a central-time, central-space (CTCS) finite-difference method (FDM) for numerically solving partial differential equations (PDE). The CN scheme is the average of the implicit  and the explicit  schemes and can be used to numerically solve the Black–Scholes–Merton PDE [4, 5]. The CN scheme produces estimates of greater accuracy than either the explicit or implicit schemes. •et; The asset log price into uniform steps with length , using nodes indexed . •et; The option maturity time into uniform steps with length , using nodes indexed . •et; The Crank-Nicolson  scheme, also referred to as "central-time, central-space (CTCS)", uses the average of the above approximations. The error term of the CN scheme is . Compared to the implicit scheme, the explicit is considered simpler and faster but less stable and accurate. It is relatively accurate for a small number of steps. The explicit scheme is similar to the trinomial tree , in that both provide an explicit formula for determining future states of the option process in terms of the current state, whereas the implicit and CN schemas require the iterative solution of linear equations linking consecutive time steps. •et; The American and European put option estimates at , depending on the underlying asset spot price. The European put value is never greater than the American, because the American put can be exercised at any time up to maturity, while the European put can only be exercised at maturity. •et; The 3D illustration of the American put option values over the spatial grid. 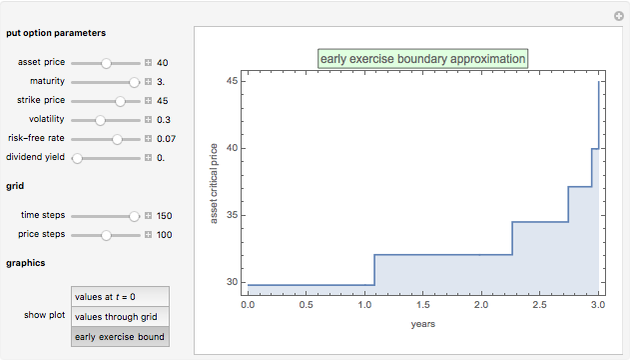 •et; The early exercise boundary approximation for the American put option. Whenever the asset price falls below this boundary, early exercise is considered optimal and the option is instantly exercised. J. Crank and P. Nicolson, "A Practical Method for Numerical Evaluation of Solutions of Partial Differential Equations of the Heat-Conduction Type," Proceedings of the Cambridge Philosophical Society, 43(1), 1947 pp. 50–67. doi:10.1017/S0305004100023197. M. J. Brennan and E. S. Schwartz, "Finite Difference Methods and Jump Processes Arising in the Pricing of Contingent Claims: A Synthesis," The Journal of Financial and Quantitative Analysis, 13(3), 1978 pp. 461–474. www.jstor.org/stable/2330152. J. Hull and A. White, "Valuing Derivative Securities Using the Explicit Finite Difference Method," Journal of Financial and Quantitative Analysis, 25(1), 1990 pp. 87–100. www.jstor.org/stable/2330889. F. Black and M. Scholes, "The Pricing of Options and Corporate Liabilities," Journal of Political Economy, 81(3), 1973 pp. 637–654. www.jstor.org/stable/1831029. R. Merton, "Theory of Rational Option Pricing," The Bell Journal of Economics and Management Science, 4(1), 1973 pp. 141–183. www.jstor.org/stable/3003143. P. Boyle, "Option Valuation Using a Three Jump Process," International Options Journal, 3(2), 1986 pp. 7–12. 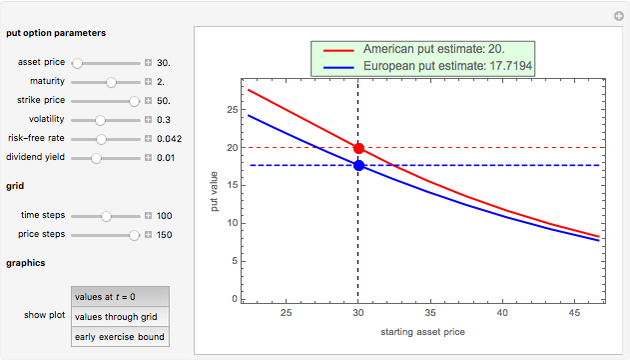 Michail Bozoudis "Pricing Put Options with the Crank-Nicolson Method"